By LUDWIG VON KOOPA - Putting data behind so-called "kiddy" labels. Writing about a study got me thinking: KoopaTV should conduct a study. So I did. This article is just the data. Next article (Part 2) will be my analysis. (Update August 15: Scroll to the bottom of the article for the link to Part 2.) 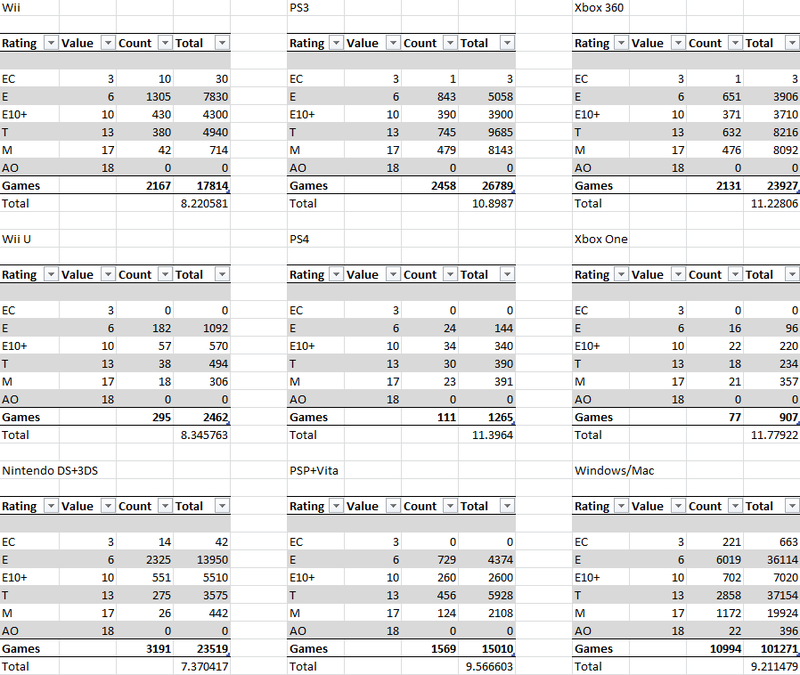 This is a breakdown of ESRB ratings for every console since the PlayStation 2 era. Methodology posted below the charts. Everything is done in Excel. If you want the file I'd be happy to send it. Feel free to share these statistics to your friends! Just leave them this article's url when you do so as credit. Green = E. Yellow = E10+. Nothing new here, just a compilation of the above. METHODOLOGY: These statistics are accurate as of August 9 2014. For every console but the Nintendo GameCube, Sony PlayStation 2, Microsoft XBox, and Nintendo Game Boy Advance, the statistics come from the ESRB's search engine. For those four exceptions, the GameStop search engine was used. The GameStop search engine is not 100% accurate and does not cover every game, but it is close enough and definitely more than representative of a sample to reach an average. The numbers assigned to each rating is the lowest age a player should (according to the ESRB) play games with that particular rating. The number of games with those ratings is then multiplied by that age, and then those multiplied numbers (one for each rating) are added together and then divided for every game released on that console to achieve an average ESRB rating for games released on that console. 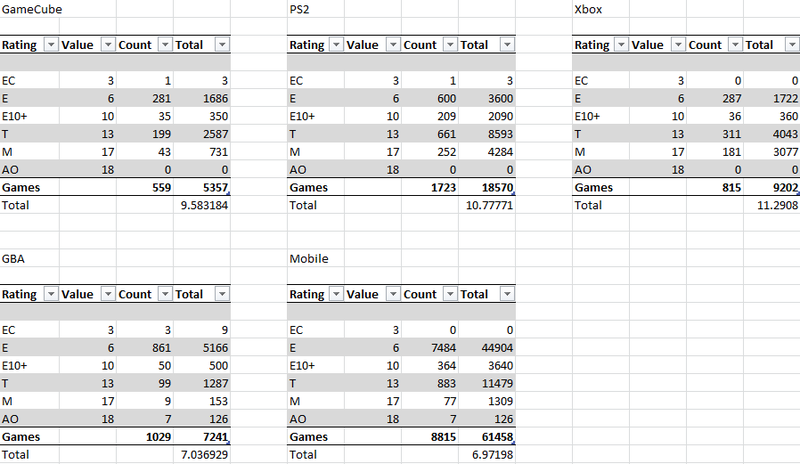 Aggregate average numbers assume that multi-platform games (Game X for Consoles A, B, and C) are all different games. This means multi-platform games have far more influence on the average than platform-exclusive games. 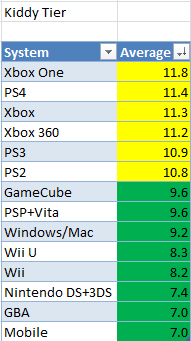 Average per console manufacturer is not an average of averages. It is the sum of all games released on that manufacturer's console dividing into the sum of the raw rating scores. This explains why, for example, Microsoft's average is lower than you'd expect at first glance: The vast majority of the games released on a Microsoft console have been on the Xbox 360, which significantly shifts the average down from the higher-rated Xbox and Xbox One. The Everyone 10+ rating did not come into existence until 2005, thanks to the GameCube game Donkey Kong Jungle Beat. This skews games from the GameCube-Xbox-Game Boy Advance-PlayStation 2 era to have more T-rated games than the future generations would have. This is because games that would be rated E10+ now were rated T back then. Many think games such as Super Smash Bros. Melee would be rated E10+ today. Not all ESRB-rated games come to market, but the majority of them do and so we feel confident in our methodology. Stay tuned to KoopaTV for Ludwig's analysis of these figures! You've stayed tuned long enough. Here is the analysis, just a click away! This definitely says something about half of the games that are published to the Xbox and Playstation. And then come all the Wii games. What I find quite interesting, and I'll write about this in Part 2, is the sheer number of games just exploded in the Xbox 360-PS3-Wii generation. This was really interesting! One obvious thing that could be interesting to consider would be weighing games by sales numbers, but I'm not sure how reliable all that data would be and I'm doubtful anyone's tried compiling it by ESRB before just due to the sheer number of stuff that needs to be crunched. Obviously surveys might hit the mark a bit more accurately on the actual age, but the perceived age range via ESRB is probably a similarly useful metric. Overall this was a really cool read, and I'd definitely love to see more in this vein -- if I can think of any good ideas, I might actually try this myself and submit it as a guest article. Yeah, I'm not in the mood to compile sales numbers for thousands of games and then make a weighted average. ...Although I'm confident that Excel could handle it. Oh, yeah, you're free to use the data and manipulate it for your own devious ends.